Saint Nestor the Chronicler, of the Kiev Caves, Near Caves was born at Kiev in 1050. He came to St Theodosius (May 3) as a young man, and became a novice. St Nestor took monastic tonsure under the successor to St Theodosius, the igumen Stephen, and under him was ordained a hierodeacon. Concerning his lofty spiritual life it says that, with a number of other monastic Fathers he participated in the casting out of a devil from Nikita the Hermit (January 31), who had become fascinated by the Hebrew wisdom of the Old Testament. St Nestor deeply appreciated true knowledge, along with humility and penitence. "Great is the benefit of book learning," he said, "for books point out and teach us the way to repentance, since from the words of books we discover wisdom and temperance. This is the stream, watering the universe, from which springs wisdom. In books is a boundless depth, by them we are comforted in sorrows, and they are a bridle for moderation. If you enter diligently into the books of wisdom, then you shall discover great benefit for your soul. Therefore, the one who reads books converses with God or the saints." In the monastery St Nestor had the obedience of being the chronicler. In the 1080s he wrote the "Account about the Life and Martyrdom of the Blessed Passion Bearers Boris and Gleb" in connection with the transfer of the relics of the saints to Vyshgorod in the year 1072 (May 2). In the 1080s St Nestor also compiled the Life of the Monk Theodosius of the Kiev Caves. And in 1091, on the eve of the patronal Feast of the Kiev Caves Monastery, he was entrusted by Igumen John to dig up the holy relics of St Theodosius (August 14) for transfer to the church. The chief work in the life of St Nestor was compiling in the years 1112-1113 The Russian Primary Chronicle. "Here is the account of years past, how the Russian land came to be, who was the first prince at Kiev and how the Russian land is arrayed." The very first line written by St Nestor set forth his purpose. St Nestor used an extraordinarily wide circle of sources: prior Russian chronicles and sayings, monastery records, the Byzantine Chronicles of John Malalos and George Amartolos, various historical collections, the accounts of the boyar-Elder Ivan Vyshatich and of tradesmen and soldiers, of journeymen and of those who knew. He drew them together with a unified and strict ecclesiastical point of view. This permitted him to write his history of Russia as an inclusive part of world history, the history of the salvation of the human race. The monk-patriot describes the history of the Russian Church in its significant moments. He speaks about the first mention of the Russian nation in historical sources in the year 866, in the time of St Photius, Patriarch of Constantinople. He tells of the creation of the Slavonic alphabet and writing by Sts Cyril and Methodius; and of the Baptism of St Olga at Constantinople. The Chronicle of St Nestor has preserved for us an account of the first Orthodox church in Kiev (under the year 945), and of the holy Varangian Martyrs (under the year 983), of the "testing of the faiths" by St Vladimir (in 986) and the Baptism of Rus (in 988). We are indebted to the first Russian Church historian for details about the first Metropolitans of the Russian Church, about the emergence of the Kiev Caves monastery, and about its founders and ascetics. The times in which St Nestor lived were not easy for the Russian land and the Russian Church. Rus lay torn asunder by princely feuds; the Polovetsian nomads of the steppes lay waste to both city and village with plundering raids. They led many Russian people into slavery, and burned churches and monasteries. St Nestor was an eyewitness to the devastation of the Kiev Caves monastery in the year 1096. In the Chronicle a theologically thought out patriotic history is presented. The spiritual depth, historical fidelity and patriotism of the The Russian Primary Chronicle establish it in the ranks of the significant creations of world literature. St Nestor died around the year 1114, having left to the other monastic chroniclers of the Kiev Caves the continuation of his great work. His successors in the writing of the Chronicles were: Igumen Sylvester, who added contemporary accounts to the The Russian Primary Chronicle; Igumen Moses Vydubitsky brought it up to the year 1200; and finally, Igumen Laurence, who in the year 1377 wrote the most ancient of the surviving manuscripts that preserve the Chronicle of St Nestor (this copy is known as the "Lavrentian Chronicle"). The hagiographic tradition of the Kiev Caves ascetics was continued by St Simon, Bishop of Vladimir (May 10), the compiler of the Kiev Caves Paterikon. 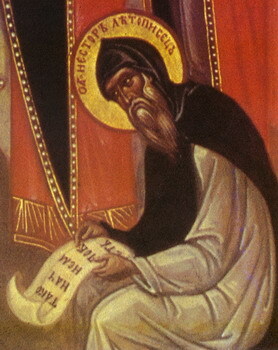 Narrating the events connected with the lives of the holy saints of God, St Simon often quotes, among other sources, from the Chronicle of St Nestor. St Nestor was buried in the Near Caves of St Anthony. The Church also honors his memory in the Synaxis of the holy Fathers of the Near Caves commemorated September 28 and on the second Sunday of Great Lent when is celebrated the Synaxis of all the Fathers of the Kiev Caves. His works have been published many times, including in English as "The Russian Primary Chronicle".